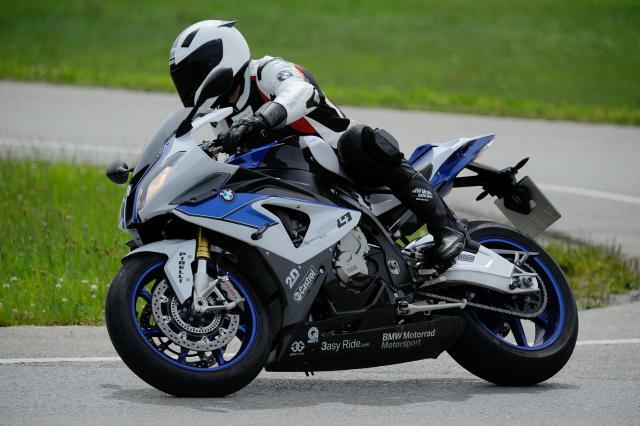 CORNERING-ABS will soon be available as a retro-fit option for BMW's highest-specification S1000RR, the HP4, the manufacturer has announced. Owners can have the range-topping sports bike upgraded for a price announced in Germany of €380 (£300). A release from the firm says 'ABS Pro' will be offered 'initially' on the HP4, suggesting more models are to get the option. The firm also says it's the 'first ever cornering ABS for supersports bike'. Cornering ABS is designed to prevent the tyres from washing out under braking even when banked over in a corner. KTM introduced the same Bosch-developed system on the 1190 Adventure this year. It also stops the tendency of the bike to stand up and go straight on under braking in a corner. The KTM system is offered on 2014 1190 Adventures and as a retro-fit software upgrade to earlier editions. BMW's retro-fit cornering ABS will be available from dealers for the HP4 from the end of October. BMW said: 'The function ABS Pro represents a consistent refinement of the Race ABS in that it now enables ABS-supported braking when cornering. ABS Pro is offered as a retrofittable option which can be acquired through BMW Motorrad dealerships and is initially reserved exclusively for the top supersports model in the BMW Motorrad product range, the HP4.